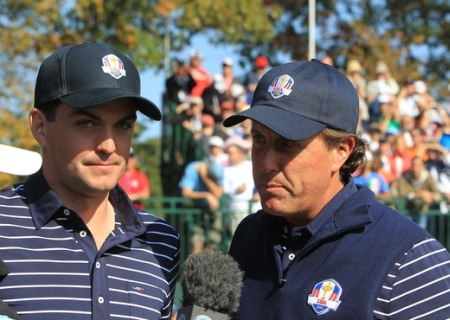 Keegan Bradley was the star for Davis Love’s US squad. 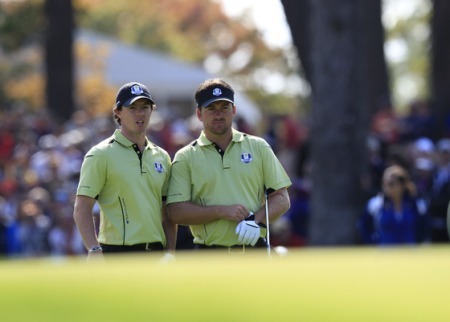 Photo Eoin Clarke/www.golffile.ieRory McIlroy and Graeme McDowell were mown down by Davis Love’s new superstar pairing as the USA moved ominously into a 5-3 lead after the opening day of the Ryder Cup. The Ulster pair crashed to a 2 and 1 fourball defeat to the brilliant Keegan Bradley and Phil Mickelson, the men who stole Sergio Garcia and Luke Donald’s unbeaten foursomes record with a 4 and 3 morning win. Jose Maria Olazabal later confessed that he had planned to rest McDowell in the afternoon. He benched Sergio Garcia instead and the Potrush man was clearly struggling and fatigued by the end. McIlroy said: “They got off to a very fast start, and at the end of the day we just gave ourselves a little bit too much to do. We just didn’t start as well as we would have liked. The 26-year old from Vermont was simply sensational on the front nine, draining birdie putts from every corner of Medinah’s No 3 course to leave the Ulsterman four down after eight holes and on the ropes. 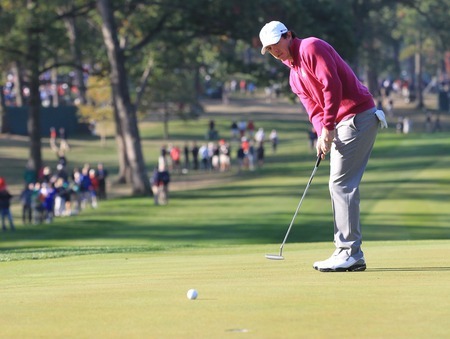 The American rookie became a Ryder Cup rock star yesterday, wielding his putter like a sledgehammer. “I’ve been looking forward to this my whole life, and to be able to play the way I did today and play with Phil, one of the best days of my life,” an ecstatic Bradley said after the win that put the USA 4-2 in front. After holing a 10 footer for birdie at the first to put the USA one up, he watched as Mickelson drained an eight footer to double the lead at the second, then birdied the third to put them three up. 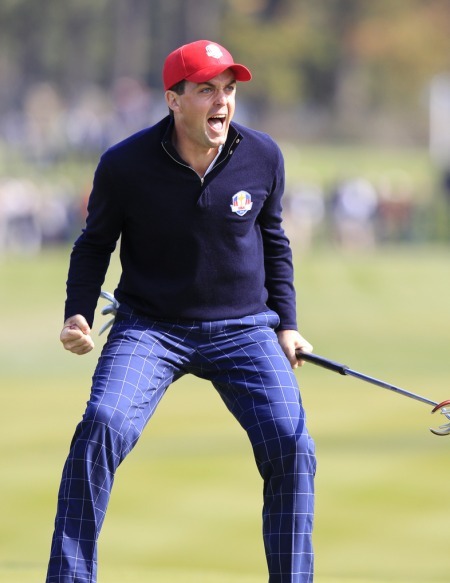 While McDowell lipped out for eagle with a brilliant pitch at the par five fifth, securing a breather with a half in birdie, the Americans were simply unstoppable. Despite losing the sixth to a par, they raced three up again at the 617-yard seventh where Mickelson made one of his trademark, Houdini-style birdies, getting up and down from 40 yards left of the green thanks to a drilled 15 foot putt. McDowell nipped a hole back at the ninth, firing a wedge to a couple of feet for a conceded birdie that still left them three down at the turn. 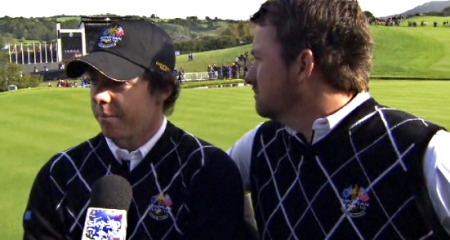 The Northern Irish pair tried hard but when Bradley faltered, Mickelson was there to back him up. Typical of his play was a crucial 30 foot par-saving for a half at the 11th and miraculous recovery to four feet from the trees at the 12th that helped the Americans remain three holes in front. McIlroy birdied the par-five 14th to cut the deficit to two holes but he had to dig deep to match Bradley’s birdie three at the next and the match eventually ended at the 17th when Mickelson hit a brilliant seven iron to two feet with McIlroy 12 feet away. It was all going pear-shaped for Olazabal’s side in the afternoon with Scot Paul Lawrie and Swede Peter Hanson crushed 5 and 4 by the unstoppable combination of Masters champion Bubba Watson and US Open winner Webb Simpson. The American pair made seven birdies in the first eight holes to go six up and while the Europeans took the 11th, the match ended at the 14th with Watson and Simpson an incredible 10 under par. With Dustin Johnson and Matt Kuchar seeing off Justin Rose and the struggling Martin Kaymer by three and two, Europe’s hopes of avoiding a fourball whitewash rested with Lee Westwood and Nicolas Colsaerts. Woods had played horribly in the morning but while he was better in the fourballs, big-hitting Colsaerts was simply sensational. The Belgian rookie produced five birdies and an eagle at the 10th to be seven under for that stretch, holing four putts of more than 20 feet. And while Woods birdie the 11th to cut the gap to one hole, Colsaerts poured in a 15 footer after a brilliant approach to the 13th to restore the two hole cushion. Woods birdied the 14th to reduce the gap to one hole but Colsaerts birdied the 15th from 10 feet to put Europe two up again. Westwood was a mere passenger and did not make a birdie all afternoon as Colsaerts produced the greatest scoring performance ever seen by a Ryder Cup rookie. What was even moe impressive was the way he stood up to a charging Woods, who was also playing on his own as Stricker faded badly after lunch. In contrast to his morning play, Woods was back to his best when playing his own ball. He birdied from 30 feet, pointing his finger in the air and striding purposefully to the 17th tee in an attempt to intimidate the opposition. It almost worked. Stricker dunked his tee shot in the water but Woods stiffed his approach. Colsaerts had a 25 footer for birdie and brushed it in to guarantee Europe at least a point. Westwood got lucky with his drive, ricocheting out of the left trees to the fairway. However, he missed the green with Colsaerts 25 feet away again and failed to get up and down for par. Woods had a 15 footer for birdie and a halved match after Colsaerts’ birdie attempt swerved across the front of the hole. But it miss low, catching a piece of the hole. “I drove it great this afternoon and was in position, but we ran into a guy who just made absolutely everything,” Woods said. “He was like seven-under through 10. I quit counting after that. 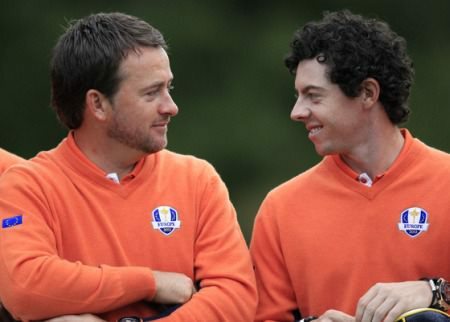 Keegan Bradley and Phil Mickelson were just too good for Luke Donald and Lee Westwood. Photo Eoin Clarke/www.golffile.ieExuding enough positive energy to power a small nuclear plant, Phil Mickelson and Keegan Bradley wiped Luke Donald and Lee Westwood from the face of planet Ryder Cup when they equalled the biggest margin of victory ever recorded in team play with a resounding 7 and 6 foursomes win that edged the United States closer to regaining the trophy.